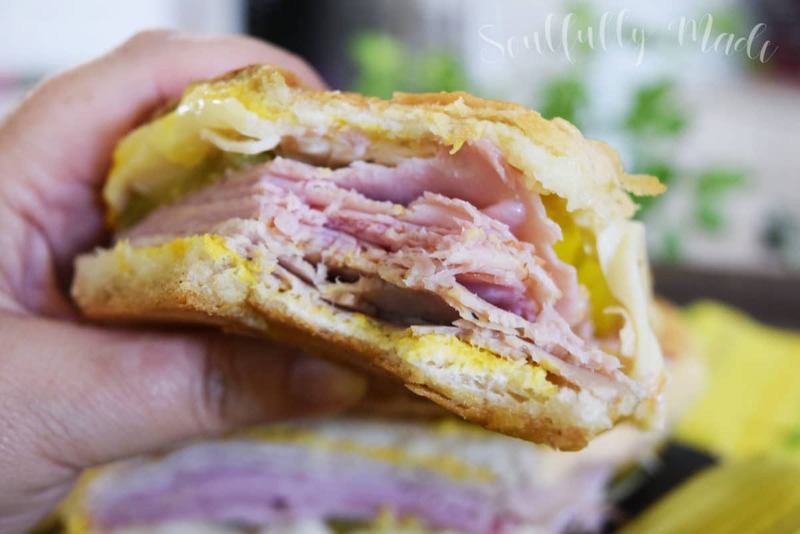 An Authentic Cuban Sandwich is a gloriously grilled sandwich filled with ham, pork, (sometimes salami), Swiss cheese, pickles, and yellow mustard on Cuban bread! 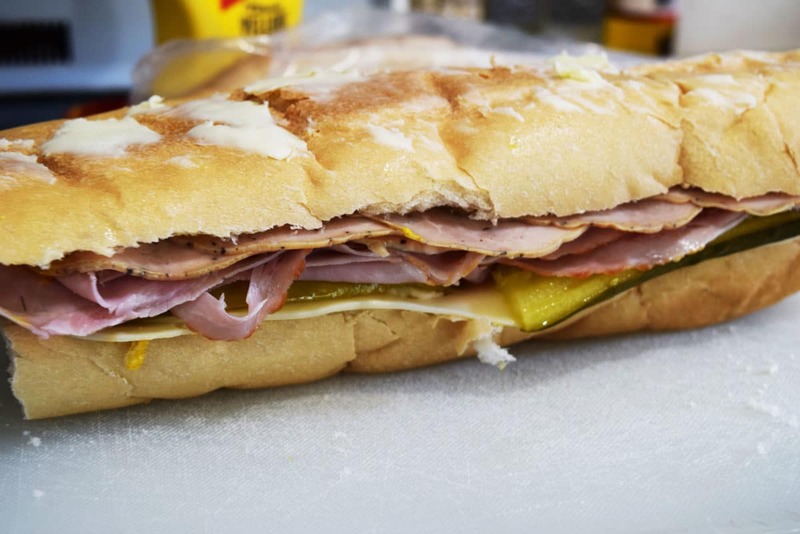 The Cuban Sandwich is a Florida tradition. I live in the Tampa Bay Area and this tasty meat and cheese filled deliciousness can be found everywhere! And for good reason it is divine! In many area’s of Tampa you can smell that aroma of Cuban bread baking and what a treat. Just slather on a little butter while it’s hot and oh my goodness!!! But when you take that bread and pile on the ingredients that build this sandwich and you really have yourself, in what many Floridians will say, is the best sandwich in America! 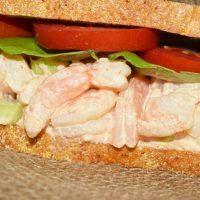 The sandwich is believed to have made it’s debut in Florida in the late 1800’s. Cuban immigrants began traveling and moving into the area. It is said that this was a common lunch item enjoyed in workers cafes. Some say the salami addition became popular in the Tampa area because of the Italian influence also present. I say I have tried it both ways and like it either way – I know gasp of the die hards! When making the sandwich, if you want to leave off the salami, increase the ham portion to substitute for it. WHAT is your vote Salami – NO or YES?? Let me know in the comments or head over & vote on Facebook! Now the last and final part to making this sandwich GREAT is the Butter & Pressing it! So the real deal is NO grill marks. My press has them so to keep it real, I use a cast iron skillet and put something heavy on top like a foil wrapped brick or in my case other cast irons skillets. Flip and do the other side! After it’s pressed you are ready take a big bite out of this masterpiece! I would love to hear if you make this one at home! 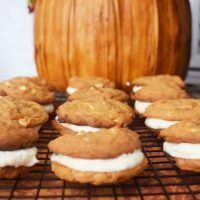 They are so delicious and easy to make! A little taste of Florida culture in every bite! I am so glad you are here! Come join in on more fun and let’s be social! Get Free Recipes from Soulfully Made delivered right to your inbox Click Here to Subscribe. Don’t forget to scroll all the way down and see all the Simple Sandwich Recipes brought to you by my taste making friends from Sunday Supper! They are too good to pass up ya’ll! I’m sharing this over at two of my favorite link up Weekend Pot Luck & Meal Plan Monday! 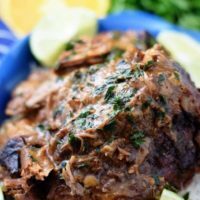 Head over and check them out you will find some amazing recipes! 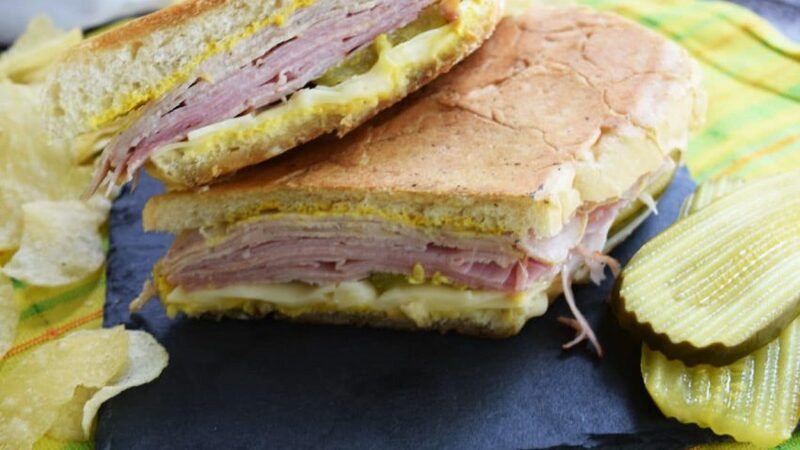 An Authentic Cuban Sandwich is grilled sandwich filled with ham, pork, (sometimes salami), Swiss cheese, pickles, and yellow mustard on Cuban bread! 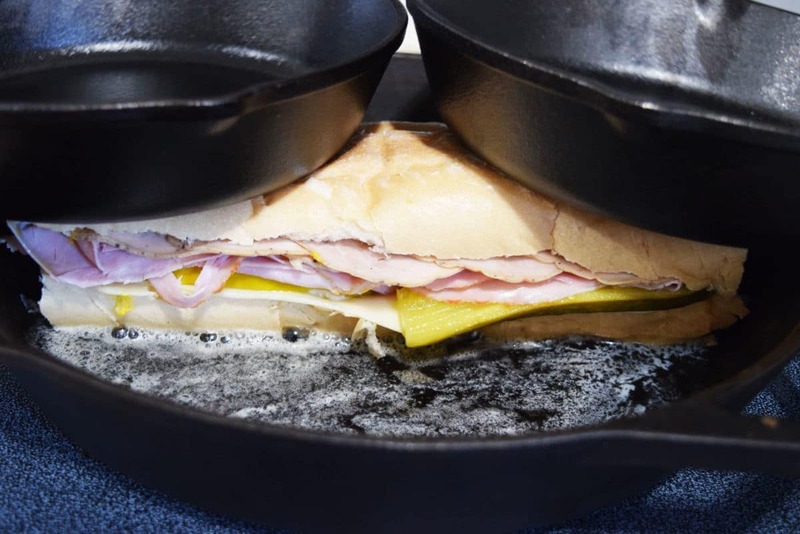 Preheat a panini press or a large cast iron skillet or griddle over medium heat. Lay bread, open side up, on a work surface and spread the bottom and top halves with mustard. Layer top half with Swiss cheese and pickles. On bottom half, layer ham, Spanish pork, and salami (if using). Close sandwiches, pressing gently. Butter top and bottom of sandwich, place on panini press and apply moderate pressure until crisp on both sides, about 8 minutes. If using a cast iron skillet or griddle, melt some butter and add sandwich. Use a second pan to press on them as the first side crisps. When crisp, flip sandwich and continue cooking while pressing until crisp on both sides, about 10 minutes total. Slice sandwiches in half diagonally and serve immediately. We lived near Tampa, Florida, for almost 6 years. Hubby discovered the Cuban Sandwich there and fell in LOVE with it. While there, I did learn how to make it, and even made some when we moved back to NC. However, it’s been a few years since I have made these for him. I am going to print this off and make for him again. He will be thrilled! Regarding the salami, he loves it, but one of the folks in the church where we were serving, who was Cuban, said it just WAS. NOT. DONE. LOL – so we are half and half on using it – sometimes yes, sometimes no. Thank you for stopping by Amy! Yes, everyone feels differently about the salami lol! I like it both ways! Where did you live? I am in Plant City. Your hubby will love his surprise! I’m always up for a good Cuban sammie! Cindy, Me too! They are so yummy! 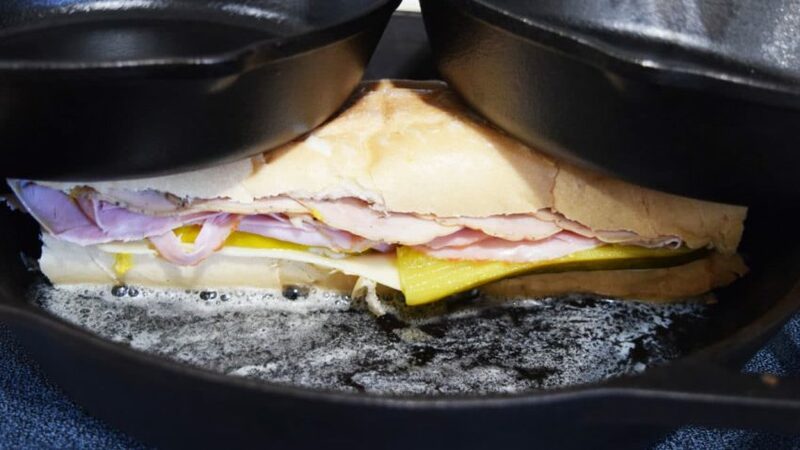 I’ve had Cuban sandwiches and I love them – I had no idea they were so easy to make! Marye, they are so easy to put together and so yummy! I have enjoyed a Cuban when I was down in Florida and enjoyed it very much. I don’t think it had salami. I am going to have to see if I can find Cuban bread here in Michigan. I may have to substitute a different kind. They are yummy! I need to find a recipe for making the bread and try sometime. I am just so spoiled to have it locally I have never tried. Thank you for the intro to the Cuban. All the times I’ve traveled to Florida, I had no idea the Cuban was a tradition. It does indeed look and sound scrumptious. You are so welcome! They are such a simple but delicious sandwich! I’m from the Tampa area so I may take them for granted a bit! They are on most sandwich shop menus. My family loves when I make them at home too! 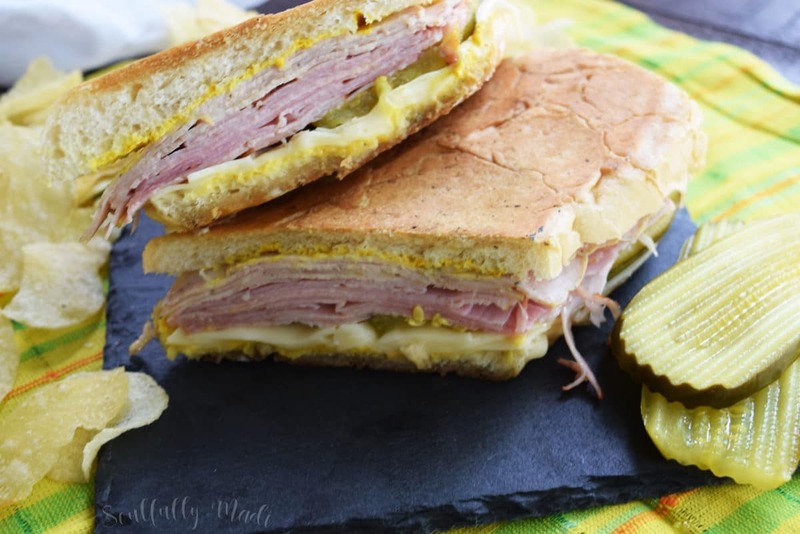 I need to track down some Cuban bread so I can make this ASAP!!! Yes you do Liz! I am so spoiled being near Tampa! Such delicious bread! 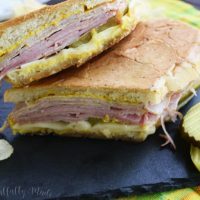 I love a good Cuban sandwich and it’s so nice to be able to make one at home. They sure are good and so easy to make at home! Hi Nikki, I like this sandwich both ways, the salami gives it a little something extra, looks delicious!!! Thank you so much Cheri! I like it both ways too and completely agree with you! 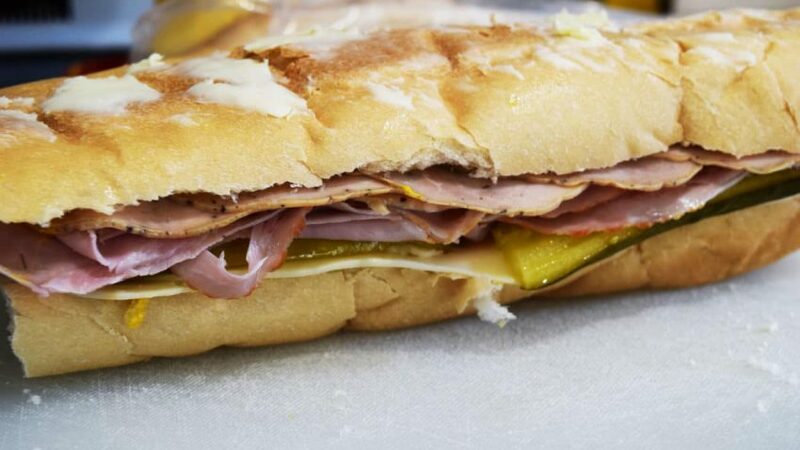 I’m a firm believer that only folks around Tampa know a true Cuban sandwich, so THANK YOU for sharing! I may be a little partial, but I agree 🙂 Thank you for stopping by Amy!